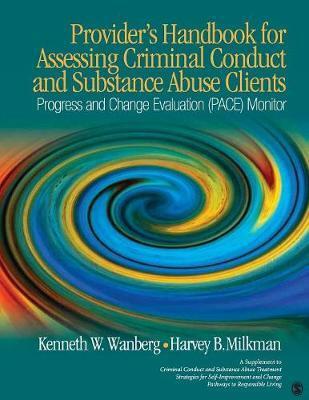 Handbook of Assessing and Treating Substance Abuse and Criminal Conduct: The Progress and Change Evaluation (PACE) Monitor is an instructive guide that helps agencies and providers assess, monitor and evaluate the change and progress made by criminal justice clients at the beginning, during and after treatment. The guide contains dozens of instruments used to assess and evaluate clients, along with a description of each item and instructions on how to score and interpret it. It was created to be used in conjunction with the Criminal Conduct and Substance Abuse Treatment: Strategies for Self Improvement and Change curriculum, but the instruments are general enough that they can be used separately and with other curriculums as well. 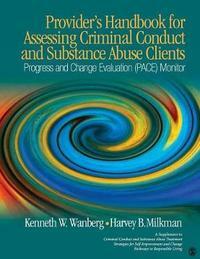 The tools provided in this book will be highly useful for anyone working with clients with co-occurring issues of substance abuse and criminal conduct. Kenneth W. Wanberg, ThD, PhD, has academic concentrations in biology, mathematics, clinical psychology, psychology of religion, psychometrics, quantitative analysis, and interpersonal communication and the psychology of spoken language. He worked as a counselor and clinical psychologist with the Division of Youth Corrections, State of Colorado for 17 years. He has been doing clinical work for 50 years and has had a private practice for 40 years. He has worked as a clinician and researcher in the field of alcohol and drug abuse for over 40 years and in the field of criminal conduct and substance abuse for over 25 years. Harvey B. Milkman, PhD received his baccalaureate degree from City College of New York and his doctorate from Michigan State University. He is currently professor of psychology at Metropolitan State College of Denver. His doctoral research was conducted with William Frosch, MD, at Bellevue Psychiatric Hospital in New York City, on the User's Drug of Choice. From 1980-1981, he completed a sabbatical exploration of addictive behavior in Africa, India, and Southeast Asia; in 1985 he was recipient of a Fulbright-Hays Lectureship award at the National University of Malaysia. He has represented the United States Information Agency as a consultant and featured speaker in Australia, Brazil, Iceland, The Netherlands, Peru, Turkey, and Yugoslavia. He is principle author with Stanley Sunderwirth of "The Chemistry of Craving," and author of "Better than Dope," featured articles in Psychology Today, October, 1983 and April, 2001 respectively. From September 1992-June 2002, he was author, principal investigator, and director of Project Self-Discovery: Artistic Alternatives for High-Risk Youth, a national demonstration model funded by The Center for Substance Abuse Prevention and the Edward Byrne Foundation.